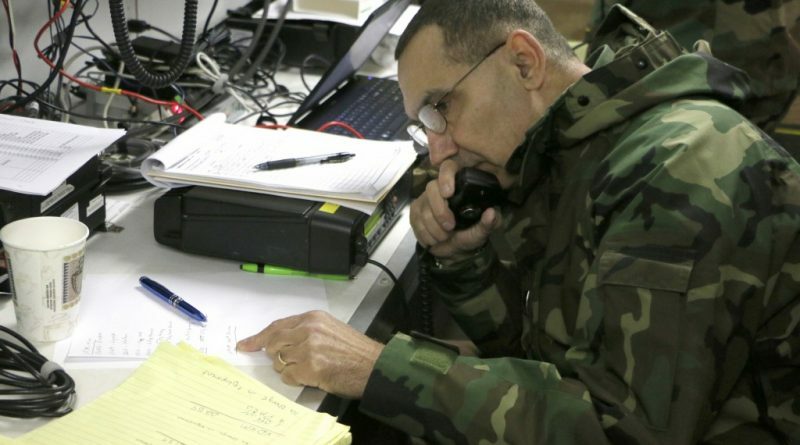 SANDSTON, Va. — Members of the Virginia Defense Force conducted a 24-hour communications exercise March 4-5, 2016, in multiple locations across Virginia. Operating in their Mobile Communications Platform trailers in Richmond, Winchester, Lynchburg and Pulaski, VDF members used high frequency radios as well as other systems for voice and data communications to communicate with civilian amateur radio operators. The 24-hour exercise was designed to test the VDF’s ability to conduct continuous operations in the event of incident that degrades normal communications capabilities. After about 16 hours into the exercise, Murdock said they had already identified some problem areas and were able to fix them. Providing interoperable communications is one of the many different missions sets the VDF provides as the all-volunteer auxiliary to the Virginia National Guard. That mission set, along with others like operations center augmentation and operational planning, take advantage of the wide variety of public safety, military and civilian skills that VDF members provide.